You have bought different types of lights for Christmas, but bummed over proper storage, getting entangled in the many light strands. Here are 3 effective tips to store large Christmas lights easily without getting the light strands damaged or lost in any way. 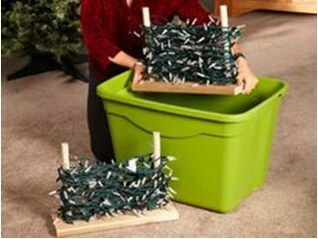 This is perhaps the easiest way to unload strings of lights; all you need to is put every string in separate bags. Put labels as to which string is in a particular bag, no need to wrap or coil! It is difficult to store light strings without causing slightest wreckage. But not after you read this. Take a wooden plank. Attach two dowels each to the side of its base. Wrap lights around the dowels and insert the stand inside the bin. Voila! Your very own safe and sweet storage for multiple light strings is ready. No damage, no tangle. This is another great storage tip to prevent lights from getting tangled and wreckage of bulbs when stored in a clumsy manner. There are two benefits of using a hose reel for storage of large light strings. First, you roll all the light strings around the portable hose reel which prevents any tangle. 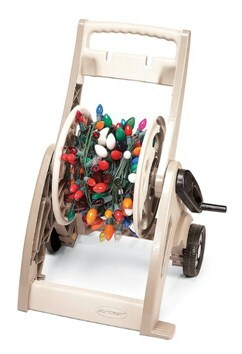 Second, the wheels make it easy to carry the hose and the light to the place where you want to put the lights on display. 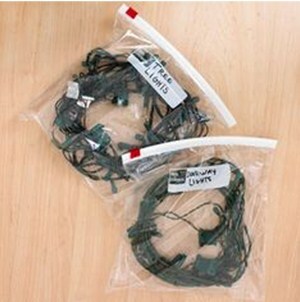 This prevents the job of carrying the light strings in your hand only to find them or you getting entangled!